Hot Melt Adhesive (HMA), also known as hot melt glue, is a form of thermoplastic adhesive that is commonly supplied in solid cylindrical sticks of various diameters, designed to be melted in an electric hot glue gun. The gun uses a continuous-duty heating element to melt the plastic glue, which may be pushed through the gun by a mechanical trigger mechanism, or directly by the user. The glue squeezed out of the heated nozzle is initially hot enough to burn and even blister skin. The glue is tacky when hot, and solidifies in a few seconds to one minute. 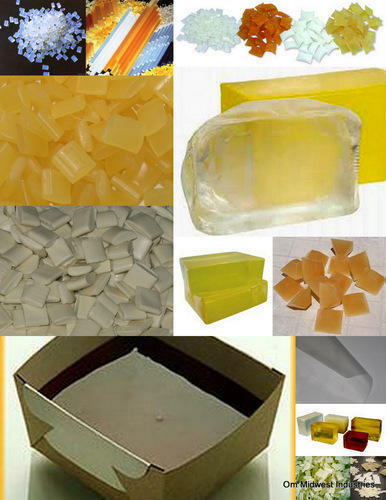 Hot melt adhesives can also be applied by dipping or spraying. Annual Turnover2009-10 Rs. 1-2 Crore Approx. Incorporated in the year of 1984, at New Delhi (India), we, Om Midwest Industries, are listed as the renowned manufacturer, trader, exporter and supplier of a comprehensive assortment of Hot Melt Adhesives & Hot Melt Pressure Sensitive Adhesives. Our exclusive range includes Hot Melt Adhesives, Hot Melt Pressure Sensitive Adhesives, and other items. The offered products are manufactured using the best grade raw material and sophisticated technology in conformity with international industry standards. Our offered products are comprehensively acknowledged due to their diverse attributes such as supreme quality, durability, smooth finish, low maintenance, user-friendly interface, compact design and easy installation. In addition to these, clients can avail the offered products from us at the most reasonable prices.